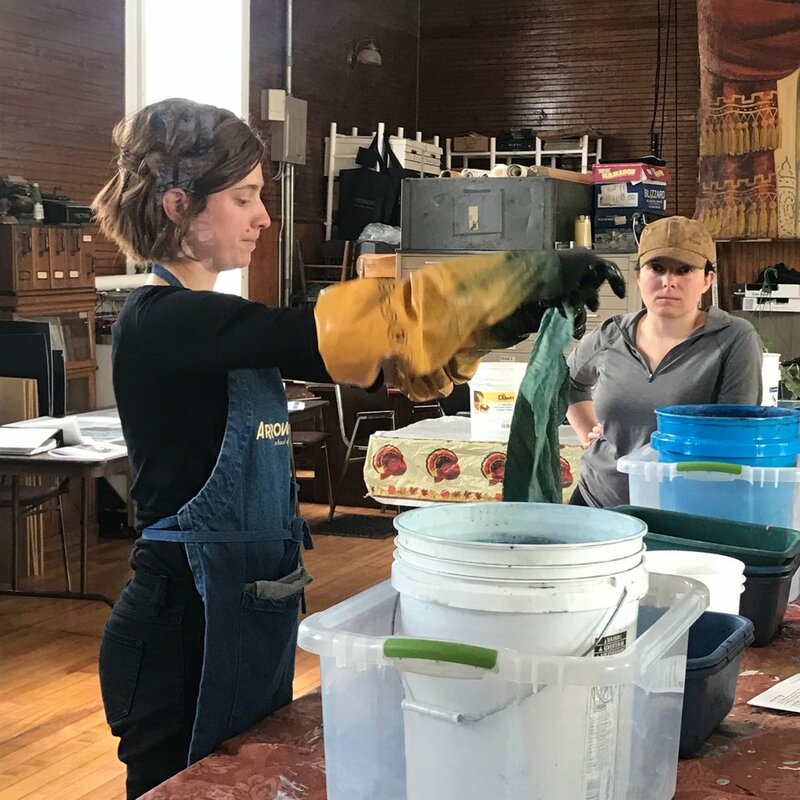 On Saturday, WonderArts' own Skye Livingston led an Intro to Indigo class for several members of the community. 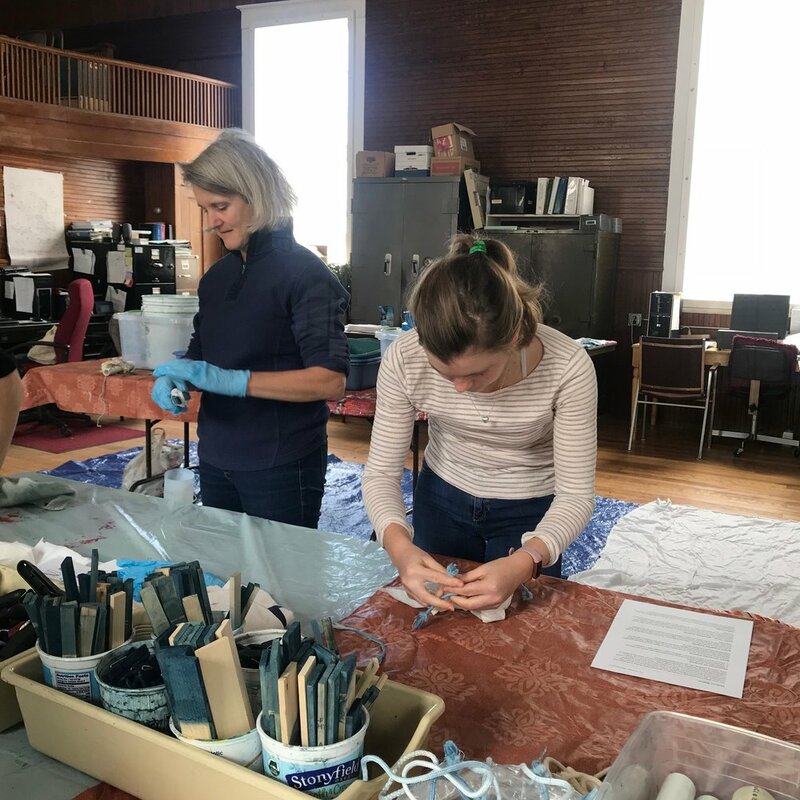 Participants were introduced to the process of dyeing with natural indigo. 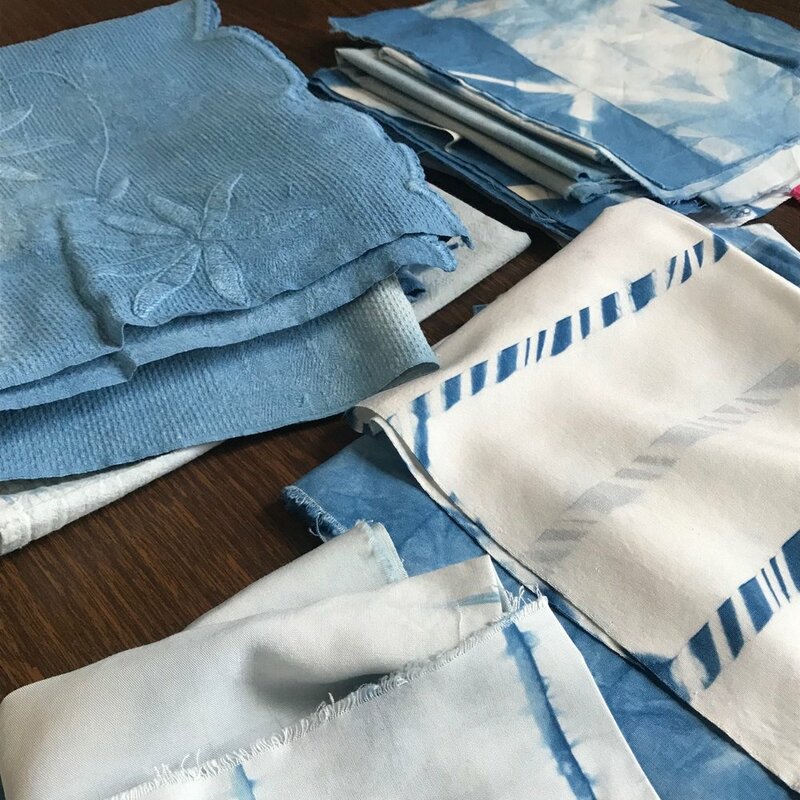 Skye demonstrated some simple Shibori folding and binding techniques to manually resist the dye, and produce varying patterns and beautiful shades of blue. 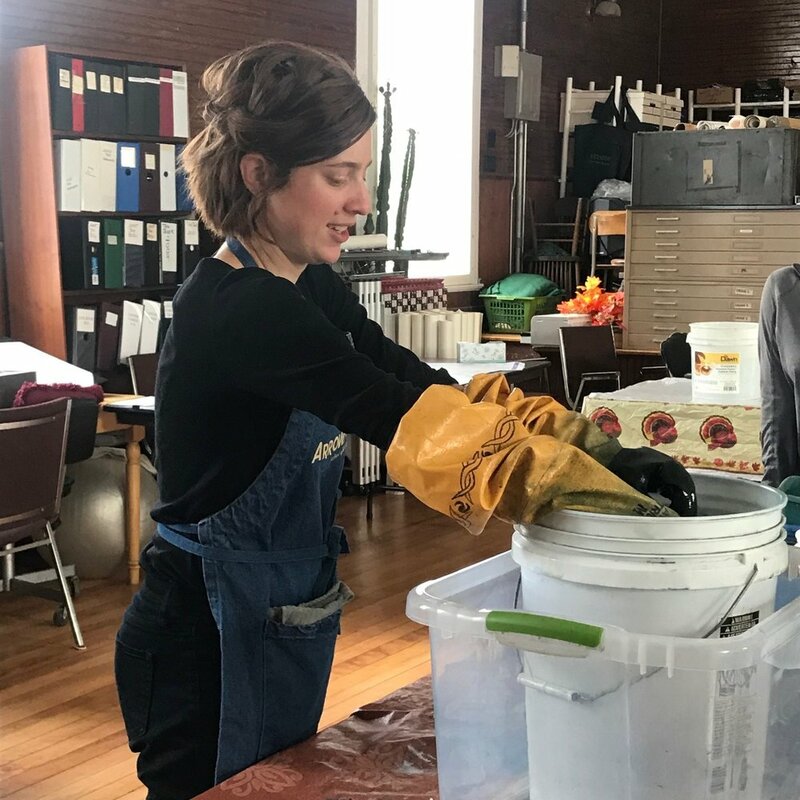 Upon dipping textiles into the dye vat, Skye explains that the initial tones can vary, and Indigo's blue hue develops after a short exposure to air through the process of oxidation. Students enjoyed experimenting with folding and binding patterns to achieve interesting results. Pole wrapping is one technique, which produces random areas of white and varying degrees of lighter blues. Another technique involves pleating the fabric, and tightly binding it between two or more wood blocks, to resist the dye. Depending on how the blocks are positioned, this technique results in geometric patterns, such as squares or diamonds, stripes, or a series of chevrons. One student came prepared with a length of handmade alpaca felt she'd painstakingly stitched and bound in preparation for the class. Everyone donned their gloves and spread out around the vats to work the magic. The finished products show just a sampling of the immense variety of beautiful patterns and styles that can be achieved using Shibori techniques and indigo dye. 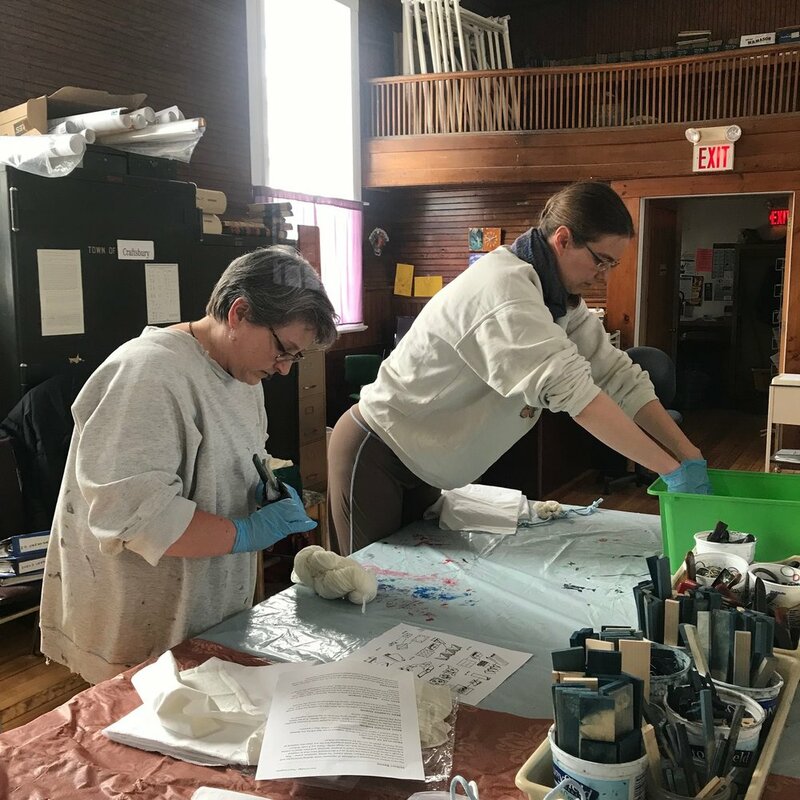 We enjoyed sharing this fascinating technique with the community, and hope you'll join us for more classes like this in the future! Older PostWonderArts Celebrates Women Entrepreneurs!